The Thanksgiving weekend is over, family members have returned to their various homes, and the busy Christmas season is upon us. The tasks to do exceed the capacity of my brain to remember them, but the overlying feeling of the week isn't really one of stress. I'm thankful. 1. I'm thankful our area has received some much-needed rain. We got over an inch on Tuesday. Given that our average yearly rainfall is just over 7 inches, having any measurable precipitation is a fairly rare occurrence, especially during drought years. We even had fog, which is even more unusual. I've been enjoying the weather! The examples of others inspire me to be better. 3. I'm thankful for this time of year--not the crazy-busy stressful side, but the lovely, peaceful real reason side. 4. 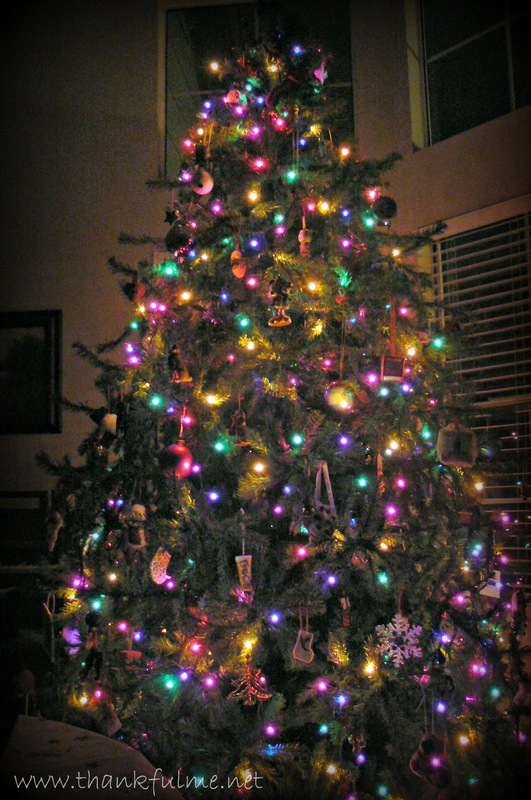 I'm thankful for the twinkly Christmas tree lights in the early morning hours. 5. I'm thankful for Christmas music, which I love to listen to. From classics like Handel's Messiah, to Tom Paxton's classic-in-another-way The Marvelous Toy, music helps fill my home with happiness. 6. I'm thankful for little procrastinated tasks finally completed. I have some decorative Christmas houses that I put up each year. Over the past, oh, I don't know how many years, one by one, the little bulbs that light the houses have burned out. I never made a special trip to the store to buy night-light size light bulbs, and I never remembered to get some when I was at the store, so my town fell dim. This year, I bought light bulbs! Ten out of the eleven houses needed a new light. I love the sight of the glowing town. Not the best photo, but the photo of the other part of the display was worse. The important thing is the lights are on! 7. 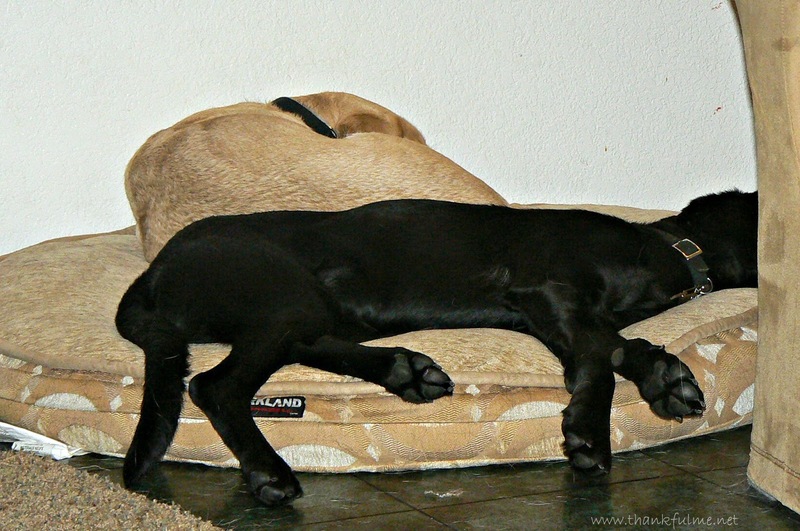 I'm thankful for sweet puppies, who get along well together. Even though Willow is much smaller than Drexel, she is definitely not overshadowed by him. She has a way of making her presence known. 8. I'm thankful for Relief Society meetings. We meet every Sunday, but also meet monthly in the evening for a more social, hands-on learning event. 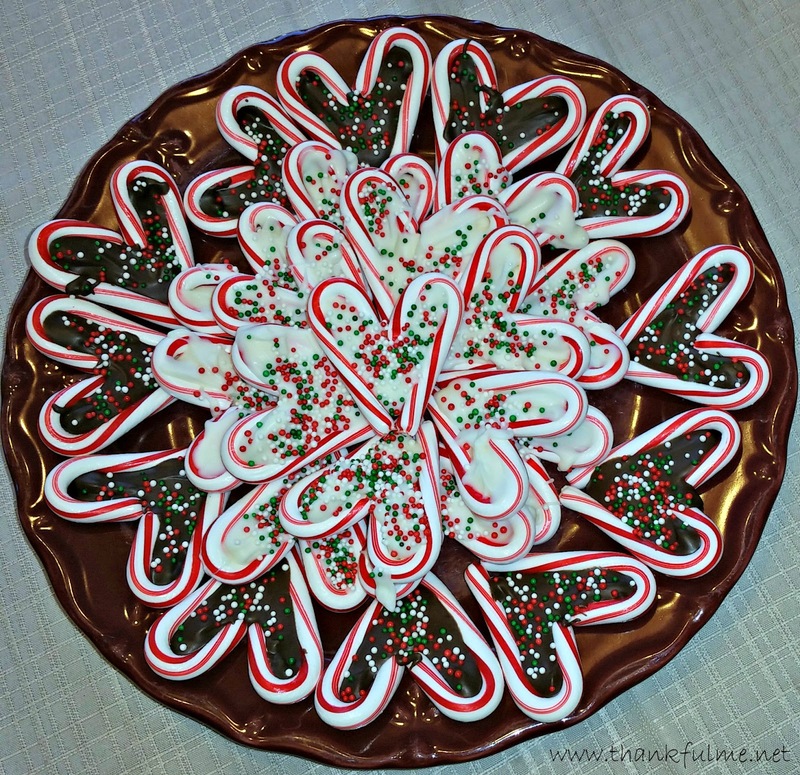 This month we made some cute, pinterest-inspired Christmas goodies. I made more at home later. Guess what will be going on the plates we take to neighbors this year? 9. I'm thankful for Christmas stories. In addition to making goodies at Relief Society, a few women shared stories that are favorites in their homes. 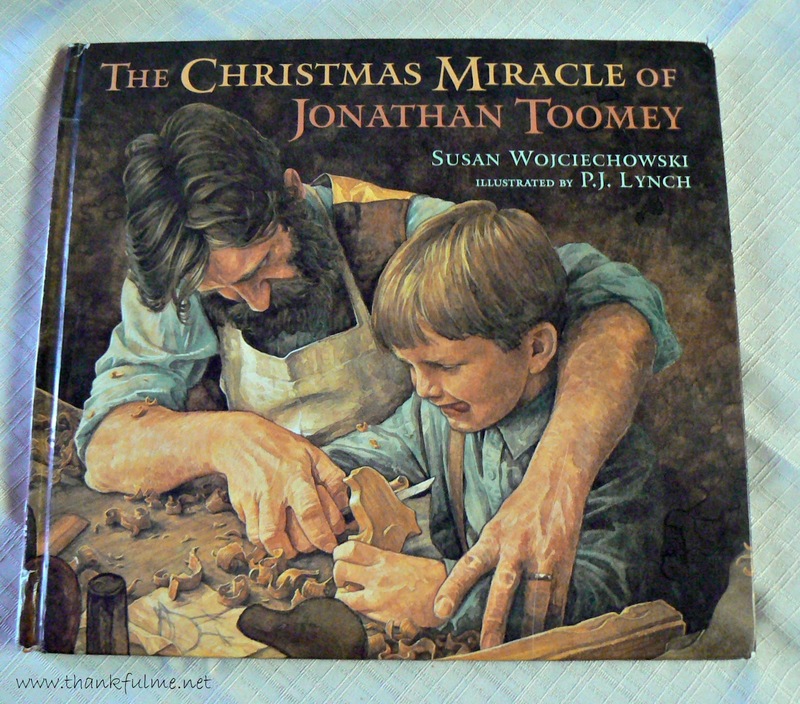 I read The Christmas Miracle of Jonathan Toomey. It is a favorite for me because the story is enjoyable on different levels, the message is one of healing, and the illustrations are beautiful. 10. You know this is coming, right? I'm thankful for John. He lovingly helps me remember things when my mind has been filled with long to-do lists. For example, yesterday he very kindly asked, "You are going to put the guard on the clippers before you begin the haircut, right?" Why yes, yes I am! If it weren't for him being observant, he might be sporting a very different hairstyle today. While I was mortified about what I almost did, he was not concerned at all. He knows it's been a busy week, and he is more patient with me than I am with myself. How has your week gone? What are you thankful for? Link up a post, or share in your comments! I really do love a good foggy morning. There is just something about them. There seems to just be something so comforting of the christmas lights in the early morning. 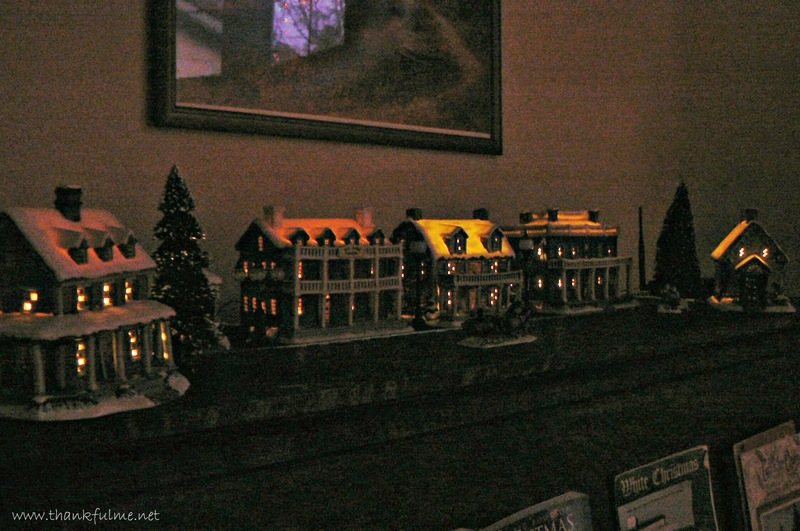 I bet the little town has the same effect now that it is all nicely lit! I need to do a light bulb run, but for my real house, not small ones. How are so many bulbs burnt out at the same time??? Having someone in our lives who is more patient with us than we are with ourselves. So important. Light bulbs fall in the same category as lost socks: household problems never to be understood. 7 inches a year?! yow! that's the kind of climate I would enjoy. 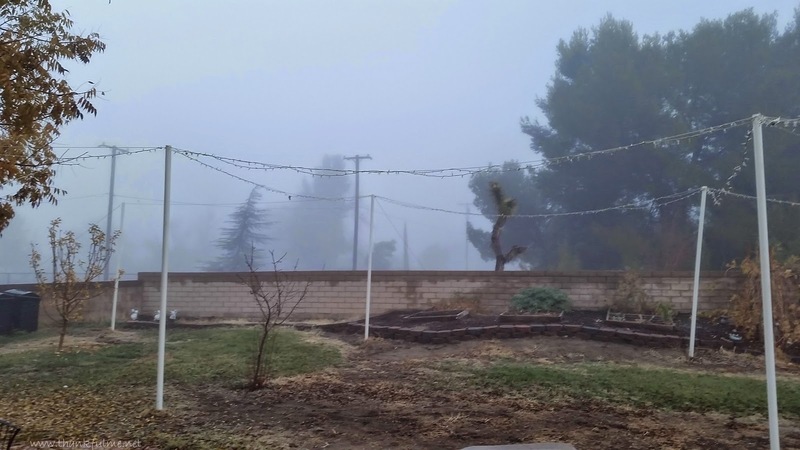 (though, if the weather is reasonable, I make a point of enjoying the rain and fog and such). as to the dogs, they are always cool. Yep. 7 inches a year, or so they say. We've been in drought conditions for so long, I think if we were to receive that much, we would all start building arks. A few years ago, the newspaper reported that the Sahara Desert received more rain than we did that year. CRAZY! I'm so with you on #3 and #4. It is possible to balance both. That truly is the beauty of the season for me. This is a beautiful list, as always. Your wonderful photos make me happy. This is a great list, as always. I love that town of lit-up houses! My grandmother had those, seeing them makes me think of how she always loved to put up her table-top tree and nativity scenes, ceramic small tree with the colored bulbs and everything. It's such a nice tradition. That is a beautiful tree. I like to sit by the glow of the tree, there's nothing like it. While your comment is sweet, I'm really no different than anyone else in my congregation. The Church of Jesus Christ of Latter-day Saints is comprised of lay leadership. No one is paid for their service, and positions are filled by assignment rather than asking for volunteers. (The person is asked privately if they will accept the calling, but there is not any campaigning, politics, etc.) Before I served in the women's organization, I was the cub scout committee chairman. I've known a bishop who, when he was released as bishop, was called to be the pianist for the children's organization. There is a calling for everyone who chooses to accept one. I always love your lists! I am thankful for the cooler evenings we are having. It means the cats will come curl up on the bed with us and keep us warm. Animal love is wonderful!